2014 marks our sixth harvest, and yet 2009, our inaugural harvest, seems like just yesterday, when we were learning how to get things off the ground. In many ways, though, 2014 reminded Lisa and me of that first year in 2009. It was hot, very hot, straight through the year. Like 2009, we were rushing to get fruit off the vines. Unlike 2009, drought had struck California and the vines were ready to hand over the fruit far earlier than we had ever seen in the history of the family vineyard. In a typical year, I would be writing this message from Paso Robles and would be just starting to harvest Eastside Bordeaux vineyards. As it stands, all of our fruit was in before the third week of September and as of Oct 3, all of our wines were pressed and in barrel. Although drought is not a positive thing, the quality of the fruit was spectacular. The clusters were smaller, the grapes were smaller, but across the board the concentration and colors were there and the flavors were terrific. Speaking of fruit, this year marked the return of our using Still Waters Vineyard, located in Creston – a small city within the Paso Robles AVA. Still Waters supplied us with the Cabernet Sauvignon that made up our inaugural Encantada Cabernet Sauvignon blend. We also purchased some of their Merlot fruit. Based on what we have seen and tasted thus far, it will be remarkable and a great blender into our Bordeaux program. It has been a long time coming but 2014 marked our first time working with Cabernet Franc. We were lucky enough to get amazing fruit from Brady vineyard, located on the East side of Paso Robles. The Brady vineyard has a distinct and intense concentration of flavors. We are very excited to see what we can build with this fruit and are hopeful that we can deliver a sumptuous Cabernet Franc that leaves you wanting more. As always, we harvested several tons of Cabernet Sauvignon from the Cuevas Estate Vineyard. The fruit this year was full of ripe blueberry and plum jam. Flavors were just exploding, so we expect a very fruit forward, intense Estate Cabernet. 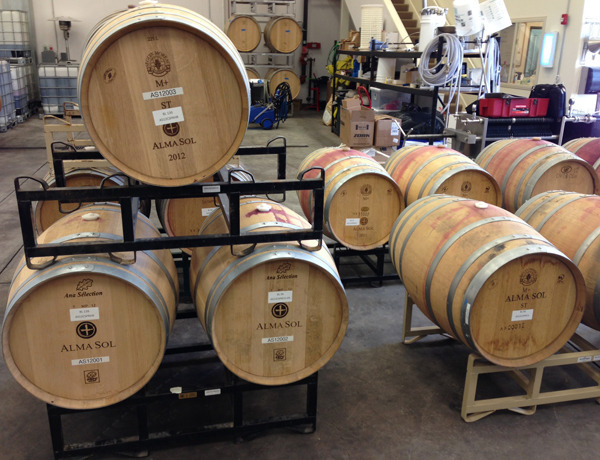 All in all, we are thrilled about the quality of the 2014 vintage thus far. Although it will still be a few years before this wine sees the light of day we wanted to share with you what you can expect. Hopefully you are as excited as we are!